New plans for a controversial slaughterhouse and chicken farm have been submitted - just six months after the first proposal was rejected. Hundreds of residents on Cardea, Park Farm and Farcet spoke out against the poultry farm, planned to be built at Kings Delph Drove when plans were submitted last year. The farm would have 100,000 chickens, and would produce Halal meat for London and the Midlands. In December the plans were rejected by Huntingdonshire District Council, a decision welcomed by North West Cambridgeshire MP Shailesh Vara, and Peterborough City Councillors Chris Harper, Ray Bisby and Brian Rush. The plans were rejected over flood concerns and impact the farm would have on a bungalow which was planned to be built and used as manager’s accommodation. The bungalow is no longer in the plans. Cllr Harper, who represents the Stanground South ward, said he would be objecting to the plans again. 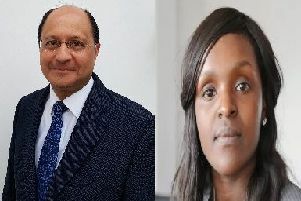 Mr Vara added: “Local people have serious fears about the impact of this proposal and the amendments provided by the new application do not in any way allay them. “The residential dwelling may have been removed from the plan but other considerable concerns remain such as the risk of flooding, pollution and congestion.